Cook sausage in a large skillet sprayed with nonstick spray. (Refer to package for temp and cook time.) Transfer to a cutting board. Clean skillet, if needed. Re-spray, and bring to medium-high heat. Add bell pepper and onion. Cook and stir until slightly softened, about 4 minutes. Reduce heat to medium. Add egg whites/substitute and seasonings. Cook and scramble until veggies are soft and eggs are fully cooked, about 3 minutes. Transfer egg scramble to a medium-large bowl. Chop or crumble sausage. Fold sausage and cream cheese into egg scramble. Lay an egg roll wrapper flat on a dry surface. Evenly distribute about 1/6th of the egg scramble (about 1/3 cup) in a row a little below the center. Moisten all four edges by dabbing your fingers in water and going over the edges smoothly. Fold the sides about 3/4 inch toward the middle, to keep filling from falling out. Roll up the wrapper around the mixture and continue to the top. Seal with a dab of water. Place on the baking sheet, and repeat to make 5 more egg rolls. HG Tips: Make these in advance, and reheat in the toaster oven for 3 - 5 minutes. They're also oddly delicious straight out of the fridge! 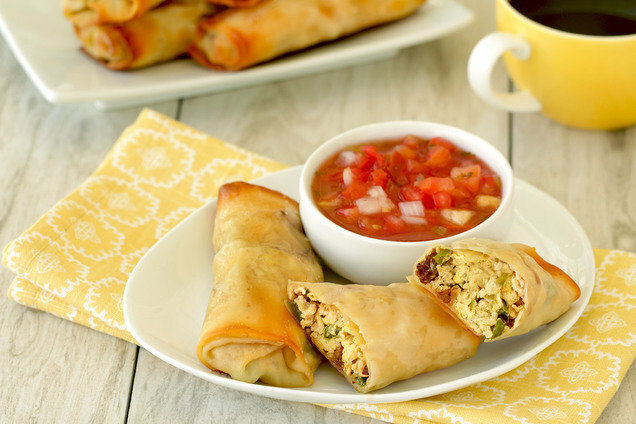 Hungry for More Unconventional Egg Roll Recipes? It's almost the end of Turkey Lovers' Month (June). If you haven't made our incredible Totally Thai Turkey Burgers, you're missing out BIGTIME. You've gotta tell everyone about these babies! Click "Send to a Friend," or forward the recipe now.